The Wood Weta 'wood hogger' makes quick work of hog fuel (woody biomass usually from forestry wate). Making hog fuel with the Wood Weta wood hogger. With an iconic-sounding name like Wood Weta, there are no prizes for guessing that this machine is built in "Godzone". Having said that, a few offshore entrepreneurs have tried to imitate Kiwiana to increase their products' marketability. But rest assured this behemoth is, in my opinion, Kiwi engineering at its best. To be honest, I actually think New Zealanders are a little full of themselves when it comes to innovation, and I reckon the No 8 wire mentality faded at least two decades ago. This may be going out on a limb, but if you take a good look around, the No 8'ers of today are actually the immigrant communities who spend time fixing the things that good ol' Kiwis throw in the rubbish. So when a really good idea from New Zealand does come along, it stands out from the crowd. The Wood Weta is a prime example. Spotting this exceptional looking machine at the September Forestry Expo, I knew instantly I had to see it operating in the flesh. Primarily designed to produce hog fuel, the machine is used to provide the heat needed for biomass energy plants. Although energy plants such as these are fairly commonplace overseas, New Zealand has not been very quick on the uptake, especially as machines like the Wood Weta are quite rare. With a fairly small window of sales opportunity in the forestry sector, it has also been designed to take advantage of the asphalt recycling, soft aggregate and limestone markets as well. As far as making hog fuel from forestry waste goes, this machine is a champ. Speaking to its designer and builder Rodney Sharp, I would have to say that one would be hard-pressed to find a person with more knowledge in this field. As he described the various problems encountered with traditional wood hoggersand the solutions he has found, I was more than impressed, and his ability is clear to see. Indeed, it is understandable as to how the Wood Weta has such great advantages on traditional designs. 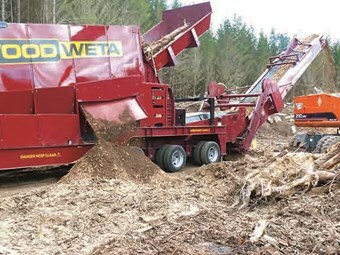 The Wood Weta runs a 560hp QSX15 Cummins engine that drives (via hydraulically set V-belts) the cutting drum and trommel screen, along with hydraulics for the stacking conveyor and feed-in bed. Access to the engine area is easily gained by a stairway, and the whole front cover can be removed to extract the complete engine if needed. The whole plant can be hydraulically folded out within a few minutes of arriving on-site, and, once fired up, the operator has full control of the machine via a remote control. Simply explained, logs and stumps are placed on a bed. This is then raised, tipping the raw product into the revolving trommel screen. This removes dirt and other contaminants before the wood is then chipped into hog fuel. Now, while that sounds like a very straightforward and easy process, there are a number of factors that should make the machine a purchaser's first pick. Primarily, all the nasty work is contained within the machine, thus eliminating the risk of dangerous projectiles firing out, as can happen occasionally. Second, unlike traditional hoggers that chew the wood on a 90-degree angle, the Wood Weta chews it on a 30-degree angle, something that means that it tears the wood at the same time which leads to less energy (diesel fuel) expenditure. The 'torn' wood is then re-fed to the cutting drum until it is small enough to pass through the trommel screen apertures, and then out into the stockpile. This whole process occurs very smoothly, and the large stumps and logs handled are no match for the Cummins powerplant, which hums along without missing a beat. For a machine of this size, noise levels are quite low. However, ear protection in close vicinity is recommended. Production wise, it was a little difficult to gauge, but I would have thought the machine was making around 30-cubic metres per hour - maybe even more. to get into making hog fuel or processing soft aggregate, then this would certainly be a hard machine to look past. Hog fuel, or woody biomass, is chewed up timber (generally untreated), usually sourced as unused forestry waste. One-cubic metre of solid wood equals around 2.7m3 of hog fuel. There are three main size specifications ranging from between 3.15mm to 300mm. The fuel must be free of non-wood contaminants, such as dirt, and contain less than two percent bark. Feel free to ask a question about this story or leave a comment on the Deals On Wheels page. 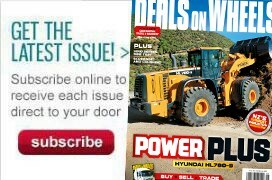 For the latest reviews, subscribe to Deals On Wheels magazine here.